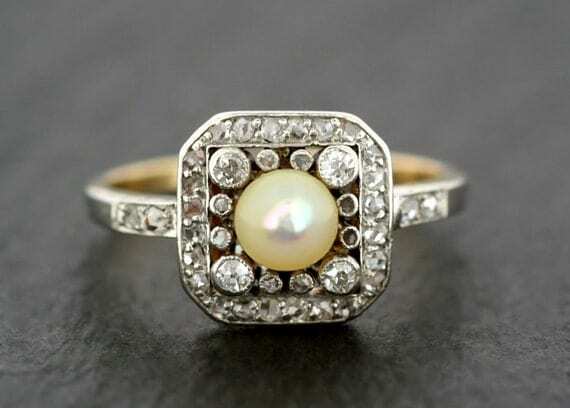 Pearls have recently developed a strong association in many peoples minds with twin sets and grandmothers, but natural pearls were at one point worth more than diamonds, and were even more popular. Natural pearls are very rare, and very expensive as they don't often form and are difficult to find. Pearls form naturally within shellfish when a piece of grit makes it's way into the lip, and the animal slowly coats the grit with nacre, making it into a pearl. Kokichi Mikimoto, a Japanese entrepreneur is credited with producing the first cultured pearl, although the Chinese had used a similar method to create tiny figures of buddah with a pearl finish for at least 700 years. In this process tiny balls are placed into oysters or mussels. Pearls are thought to aid digestion and ease emotional stress, and the white colour can be seen to symbolise a pure heart.